A while back I detailed in a blog post about my love for my favorite novelty appliance– my Yonanas machine. Well, a new development has happened that warranted a post and I just had to share. 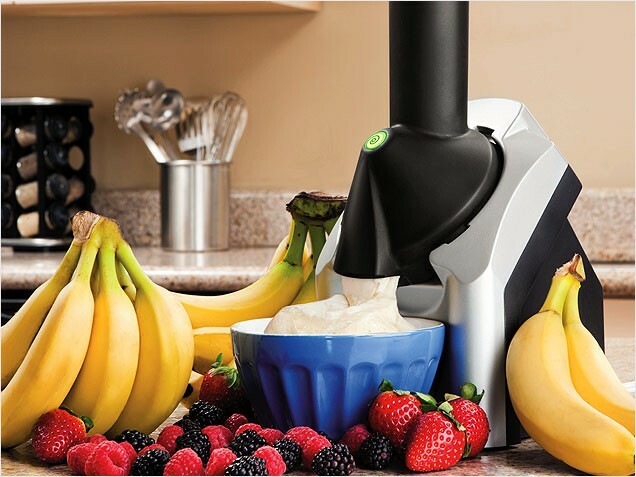 For those who don’t know, Yonanas is a machine that is specifically designed to take frozen bananas and turn it into a soft-serve ice cream-like substance. The result is pure heaven. Sure, you could use a blender. You could even use a food processor. Well I have both those appliances and I’m telling you right now, they do not surpass the awesomeness that is the Yonanas machine. But the product itself is not what this post is about. This post is to extra rave about the customer service which I recently had a great experience with. You see, a couple months back…there was an “incident” with my Yonanas machine. My husband and I had hosted a party and I made strawberry Yonanas for about 12 guests. I thought my husband had cleaned the machine. He thought I had cleaned the machine. The result was an icky, gross, sticky, moldy mess. So my husband promised he could save my beloved machine. There was a lot of soap…a ton of bleach…but nope. Sure, most of the machine survived…but the blade…oh that poor cone-shaped blade. Even though the Hubster promised me he had decontaminated the inner part, it still looked terrible and sketchy. Finally after months of watching him try to fix it, I told him I was just going to but a whole new machine (after all, the new ones come in different colors!). He, being the frugal sensible person that he is, begged me not to and encouraged me to contact the company to buy a replacement part. After all, it was only that ONE part that was kinda funky. So I went online and emailed customer service. TO MY SURPRISE, they told me they’d mail me a whole new cone blade FREE OF CHARGE. How awesome is that? Not only did they follow through with their promise, but they gave me two more of the rubber pieces that go with the blade– even though I didn’t ask for it, and they gave me a brand new recipe book of their favorite Yonanas recipes. I am now in Yonanas heaven and thoroughly pleased with my customer service experience. You can totally expect new recipes of flavored frozen banana ice cream to come! Sure, you could make frozen banana ice cream in a blender, but you probably wouldn’t get as good customer service as that. I love making banana ice cream! I usually use a blender or food processor, but I’ve been thinking about getting the machine. I have a thing (like, LOVE thing) for single use kitchen appliances (I know; it’s silly), and I’ve been eyeing this for a while now. Do it! You won’t regret it at all! It is so awesome that the customer service helped you out! Enjoy your Yonana creations!